One sunny morning last month I set off on a little adventure. As regular readers will know, prizing me out of my home county and over the border is no mean achievement (Plymouth doesn’t count). River Cottage made me an offer I couldn’t refuse however. I got an invite to attend a Preserves course at River Cottage HQ on the Devon / Dorset border with none other than Pam the Jam. I was not going to let that opportunity pass me by. I have been a fan of Pam Corbin ever since I acquired her books Cakes and Preserves, numbers 8 and 2 respectively in the River Cottage handbook series. Her recipe for apple lemon curd was a revelation and one that nicely uses up some of the windfalls I get each year from my mother’s trees. The course was actually being led by Pam Corbin together with Liz Neville, otherwise known as Liz the Pickle. This dynamic duo have been running courses together for many years and are both old hands when it comes to preserving. For some reason, this was the first Preserves course they had run at River Cottage for a couple of years. The kitchen facilities were brand spanking new as was the equipment. A massive glass window took up the whole of the back of the kitchen and looked out over the fields and up to the hills and woods. This created a very pleasant working environment. Due to a holdup on the A30, I missed the introductory talk with Pam, Liz and the other attendees, which was a bit of a shame. I just managed to grab a glass of elderflower pressé and an egg and asparagus bruschetta before we were all called to gather round and watch, listen and learn. The course was a well-balanced mixture of watching demonstrations and hands on do-it-yourself. The demonstrations were interactive and we were all encouraged to ask questions, peer into pots and have a stir. This was where I picked up a number of useful tips. I am no stranger to preserving, but I have never been taught by an expert – let alone two at the same time. Granulated sugar is the one of choice for jam making as the crystals of caster sugar are very fine and thus more likely to burn. I was already aware that to be legally called jam, the sugar content should be 60%, but I didn’t know that for keeping quality the sugar level should be at least 63%. I’d never heard of a refractometer, but we all had a go at using one to measure the sugar content. Weighing down the contents of a jelly bag with a heavy object, such as a jar filled with water and placed on a saucer, was such a simple idea, but not one I’d ever thought of. I’d also not considered making my own pectin before – simply simmer apples, strain and then freeze in small batches. Another of the many tips we were given was to macerate strawberries in sugar overnight before turning them into jam. I was reminded that when making jam, it’s best to poach skinned fruit such as plums, gooseberries and blackcurrants before adding the sugar to prevent tough skins. This was something I’d once known but had been filtered out of my brain in the mists of time. The day was a long one, starting at 10:00 and finishing at 17:00, but the time flew by. In addition to the preserves we made ourselves, we watched Pam and Liz make mint jelly (with gooseberries), lavender jelly (with apples) and elderflower cordial. Pam also had a rather interesting steam juice extractor that she demonstrated. The course information stated that fruit leathers would be included. I was looking forward to learning about this as it’s something I’ve never done. I was somewhat disappointed that this wasn’t in fact covered, but the day was so “jam” packed, I can’t see how it could have been squeezed in. There were twelve of us on the course, which with twelve workstations was the perfect number; we could have one each, work at our own pace and not get in each other’s way. In between the demonstrations, we made strawberry & gooseberry jam, lemon curd and bread & butter pickles. All three were new to me. I have made any number of fruit curds and been pleased with all of them, but for some reason I’ve never made the classic lemon curd. When I got home, I topped these chocolate waffles with the curd and combined with strawberries, it made for a heavenly repast. Strawberry jam is a tricky one to make as it has very little pectin content and although I helped my mother make it as a teenager, I’ve never tried going it alone. Gooseberries on the other hand are high in pectin. They both fruit at the same time of year, so combining the two is a fabulous idea; the jam sets easily, but has the colour and taste of strawberries. Bread and butter pickles is an American sweet cucumber and onion pickle which was traditionally served with bread and butter. I have subsequently found that it’s addictive and I’ve been using it in my sandwiches, to accompany salads and with new potatoes. We got to take home everything we made, plus one of the jars of jelly that Liz had made. It was a tough choice, but in the end I went for the mint and gooseberry. We were well looked after throughout the day. All of the weighing of ingredients and washing up was done for us. We made things dirty and they kept coming back clean. What a wonder that was. It was very hot, but the jugs of cool drinks were continuously topped up to help keep us refreshed and hydrated. Lunch was an experience in itself. As the day was so glorious, we ate outside. We were greeted with more jugs of cool elderflower and the Chef, who informed us with great gusto of the delights awaiting our table. The main dish was homegrown River Cottage lamb, but thankfully the vegetarians (and there were two of us) were very well catered for. I had a mushroom ragout, roasted asparagus and barley risotto topped off with a poached duck egg. To follow we had a strawberry, gooseberry and elderflower crumble which was just delicious. Sadly, not a single bit of chocolate passed my lips the entire day! CT decided to accompany me as he was interested in looking around the horticultural part of the farm. Not only did I welcome his company on the rather long drive to and from River Cottage, but as the evening was a fine one, we explored the nearby nature reserve and had a good walk around. Both of us were a little surprised at the scale of the horticultural operation – it was much smaller than we had expected. When I asked if all of the produce we were using was grown on site, I was told they only grew enough here to supply the kitchen. I had naively assumed that all of the produce used for cooking schools and in the various outlets were home grown. However, the walled kitchen garden was lovely – an edible landscape laid out in a most attractive manner. I couldn’t help but be envious of the abundant strawberries. Pigs sheep and cattle roamed the surrounding pasture land adding to the bucolic charm. On arrival, my breath was quite taken away, the view from the car park at the top of the hill is outstanding. It is in an Area of Outstanding Natural Beauty after all. Looking out over the valley and onto the adjoining hills , a pastural scene of beauty and tranquility met our eyes: a landscape of hills, trees and green fields interspersed with rough grazing. As I was late, I missed the tractor ride down to HQ but one of the River Cottage team was waiting to greet us and walk us down the hill. The walk was just what we needed after the long hot drive and it meant we got to see more of the lovely scenery. Everyone on the course seemed to get a lot out of it and I had a fantastic, if full on, day. Pam and Liz were on hand to help us and answer any questions throughout the day. It’s always fun cooking with others and being able to talk enthusiastically about one of my favourite subjects – food! Going home loaded with delicious preserves was a bonus. 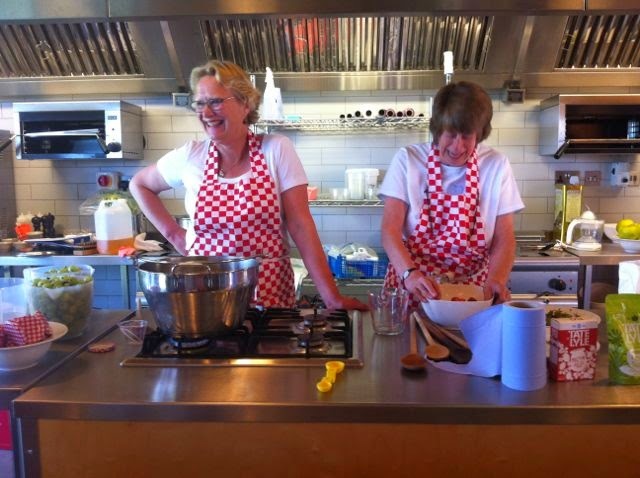 There are two more preserving courses with Pam & Liz scheduled for this year at River Cottage HQ both costing £185. That sounds like a great day. I’d love to do that course but it’s rather far away for me! I am addicted to bread and butter pickles too, a habit I brought back from that first trip to California along with the Stars and Stripes sandwich picks! You’re well ahead of the game then Janice – bread and butter pickles was a completely new on me. To attend a River Cottage course, I guess you’d need to be down this way on holiday to make it worthwhile – now how about that for an idea? Oh, I am so jealous. I love seeing River Cottage on TV and the whole idea of food from land to plate expertly done delights me. Fabulous post! Thank Heather. It was certainly interesting to visit after having heard so much about it. Bread and butter pickles are lovely – very Australian as well! This all looks fabulous. I can imagine that the combination of Pam’s bereavement and the fire at River Cottage probably contributed to the hiatus on preserving courses there for a while. Ah interesting Alicia. I didn’t know about Pam’s bereavement, so that could explain things. The new kitchens have been up and running for about a year now I think. Also didn’t know B&B pickles were an Australian thing too. Thanks Froogs, preserving food can be very satisfying as well as delicious. Thanks Linzi. I did have a great time, thank you. You could always make a holiday of it and spend a couple of days in this part of the world??? Wow! What a kitchen! Bet you were very glad you jumped the county line for the visit! That sounds wonderful. I wish I lived closer. I hope you’ll be blogging that bread and butter pickle. Thanks Kate – your book sounds a little like mine and I had a truly wonderful time. What absolutely delicious fun! Love it! what a lovely trip you had. I hope you have lots of practice with your allotment yields! Wow what an amazing trip and class and River Cottage looks amazing!! Thanks Georgie, it was great. What a fabulous day! River cottage is very much on my bucket list! Fiona, don’t tell me you haven’t been??? I need to get myself down to the river cottage to do some of their fab sounding courses. It’s a lovely place Bintu and certainly the course I did was a good one. I have my eye on some of the others too. I so miss beautiful West Dorset, having been brought up there! Sounds like you had a great day, and thank you for sharing your lovely photos. Wish they would do some veggie/ vegan courses there- don’t think I could stand seeing all the animals and then having them served up around me! It’s a beautiful part of the world indeed and I can quite see why you would miss it. I think meat is an intrinsic part of River Cottage, but you never know. Wow what an amazing day. I used to make a lot of jams and pickle but haven’t for years. I must get back into it. Love the sound of the gooseberry and mint jelly. I never knew you could make your own pectin either, must remember that. I always used to add lemon juice if I needed a firmer set but using apples sounds a great idea. Yes, it was really interesting to have a different take on combinations. using gooseberries in the jelly for pectin was not something I’d ever have thought of. This sounds like such a good course, and one where you get your own work station is brilliant. I’d love to know more about preserving as I’ve dabbled before but never fully got in to it. Sounds like you learnt a lot and were well looked after. Caroline, it was a good course. Sharing a workstation wouldn’t be the same at all, though I guess if you were going with a friend it wouldn’t be so bad. to say i’m jealous is a HUGE understatement… what a fabulous day! Ah yes Kath, their bread day does sound rather good. Superb Post and well written !Loved reading about your visit and since I’ve never really ventured into jam making it sounds all exotic and fun to me! would lurrrvvv to spend a day learning with Pam and Liz! Oh thank you Manjirik, that’s very kind of you. Making jam or any preserve is so satisfying and mostly quite easy too, so do give it a go. Thank you Vivien and thanks for explaining further about the sugar content. What a lovely day to be able to amble after such a fulsome class! Thanks Emma, it was a wonderful day – just rather annoying to have a long and unpleasant journey home afterwards.